Among the most enticing tools in Photoshop’s box of tricks are those that give you the power to reshape objects, people or even animals. Chief among these pixel-pushing tools is the Liquify command. It acts almost like a mini-app within Photoshop, coming complete with its own toolbar, menus and shortcuts. With Liquify, you can smoothly nudge a shape into something entirely new. 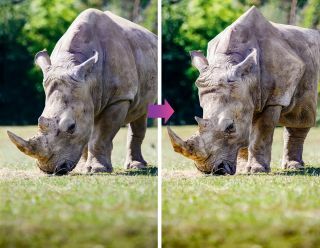 The most common – and controversial – application of this technique is to reshape the bodies of models for fashion magazine photo shoots, but it can be used for almost anything – including creating a caricature of a rhinoceros! We’ve provided the start image for this project, but if you’d like to experiment on one of your own images, why not take a pet portrait? Pets make excellent subjects for photography, as they don’t mind having a camera pointed at them and – with dogs or cats in particular – it’s easy to coerce them to capture dramatic action poses. Paint over the animal with the Quick Selection Brush (if it picks up any background, hold Alt and paint to subtract). Once you have a selection, go to Select> Refine Edge, increase Radius and check Smart Radius to improve it. Set Output to: New Layer. Hit OK.
Go to the Layers panel, highlight the bottom layer and hit Ctrl+J to duplicate it. Ctrl-click on the rhino layer’s thumbnail. Go to Select>Modify>Expand and set 15px. Go to Edit>Fill and choose Contents: Content-Aware to create a rough backdrop minus the rhino. Right-click on the top layer and ‘Convert to Smart Object’. Go to Filter>Liquify. Use the Forward Warp tool and a large brush size to nudge the edges of the animal into whatever shape you like. The Forward Warp tool is most effective with lots of short pushes. Continue pushing pixels with the Liquify tools. You can take the effect as far as you like, perhaps by making the details, like the eye here, more angular. If any areas go wrong, rebuild them using the Reconstruct tool in the Liquify toolbar. Hit OK when you’re happy. There will be messy patches around the edges of the animal. Click on the Create New Layer icon in the Layers panel and grab the Clone tool. Set Sample: All Layers in the tool options, then zoom in, hold Alt to sample the nearby background, and clone to tidy up. Pick the Spot Healing tool, set to Sample All Layers, and paint to remove any messy spots. Finally, with the top layer highlighted, click on the Create Adjustment Layer icon in the Layers panel, pick Curves, then plot an S-shaped curve to boost the colours slightly.